This is the last weekend the public can vote for their favorite entry of the James Dyson Award, an international competition that is open to product design, industrial design and engineering university level students (or graduates within 3 years of graduation) who have studied in the following countries: Australia, Austria, Belgium, Canada, Denmark, Finland, France, Germany, Holland, Ireland, Italy, Japan, Malaysia, New Zealand, Russia, Singapore, Spain, Switzerland, Taiwan, UK, and USA. The designer with the highest rating as of Midnight BST on July 20th will receive the US People’s Choice trophy and a chance to progress to the international finals where their work will be viewed by an international judging panel comprising high-profile designers and engineers, academics and journalists. James Dyson, the renowned will make the final judgment, informed by the international judges. Bag Electronic Series – a line of household electronics which eliminate wasteful packaging. Fresh, the Shrinking Milk Jug – a milk container that keeps air out and allows milk to stay fresh nearly a week longer. Galileo – a manual wheelchair with a power assist function that uses saved kinetic energy to propel the chair forward without the use of a battery. New Water – a redesigned mop wringer with filters throughout the front outputs and base of the enclosure. Roto – a bedside clock that allows someone to read it from 360 degrees. 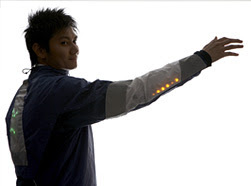 The winner of the James Dyson Award 2008 was Michael Chen, from Middlesex University in the UK, who designed Reactiv, a cycling jacket that communicates a cyclist’s intentions to other road users. First, congratulations on being featured, again *smile*, on Kathleen's blog. I am so envious you two will be rooming together. Thanks for blogging about these. I had never heard of them before. We love stuff such as thing. So thanks Naomi! I like the shrinking milk jug, that's wild! Where would we be without those that think outside the box? Your favorite is ingenious and of course you'd love it. It makes practical use of a fun little application called kids! Very cool post; thanks superdumb! Thanks for sharing the info on the Dyson awards... I think it is an amazing thing he does. Seeing as I have to use a wheelchair a lot of the time, I am partial to the Galileo, which I voted for. Whoever wins, it is a terrific thing Mr. Dyson does for our younger generation... kudos to him! And to you for reminding us. Well the rollie pollie cleaner has to win on name alone. I mean how can you beat that?